~ What I Liked: I absolutely loved the humor in DOUBLE DARE. This was a fun and quirky off-the-wall read that, for the most part, was very enjoyable. I also liked the pacing. As the story started, I really liked the main characters Sam and Lou… but not for long unfortunately. ~ What I Didn't Like: I didn't care for Lou by the 25% mark. And I didn't feel she was deserving of a HEA. She was too selfish and childish to appreciate it IMO. Sam was a little better, but I thought he was a tool ultimately. Now, what I really really didn't like (and was a huge tipping point in regards to the lower grade) was the atrocious editing. I have never seen such a horrible display of improper word usage before. Whoever the author used to proofread DOUBLE DARE needs to be fired… or something, because this was seriously B.A.D. Not at first, but certainly in the last 35%. For that reason, I'll probably be a little apprehensive about trying anything from this author again. And finally, the ending seemed too abrupt and way too tidy. Sam and Lou will probably need divorce lawyers before their one-year anniversary. ~ Final Analysis: DOUBLE DARE was enjoyable despite the negatives. It was a nice escape, that had me laughing out loud several times. Light-hearted, fast-paced and a good story. Had it been properly edited, I feel it would have been an easy 4 or 5 stars. I am so glad that you are back! 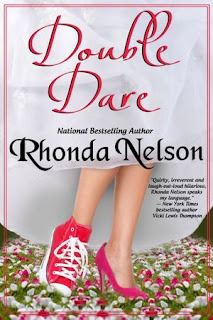 I have Double Dare but haven't gotten around to reading it. Though it does sound like it would be good for a nice breezy summer afternoon.